January | 2014 | Welcome to the world of NECCO! #Tweethearts = sweet Tweets & treats! Looking for a surprise gift for your loved one that is a truly special treat? Then it looks like it’s time for you to send your sweetheart a Tweetheart! 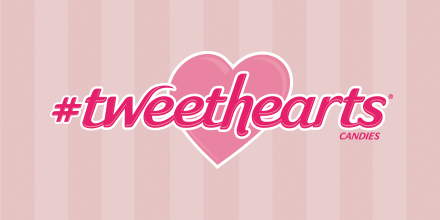 With our friends at Hill Holliday, we have just launched an awesome new program for our Sweethearts fans called #tweethearts where your loving tweets will be turned into sweet treats! And you can ship them to your sweeties as a Valentine’s Day present! Ready to get started? Just follow these easy steps! 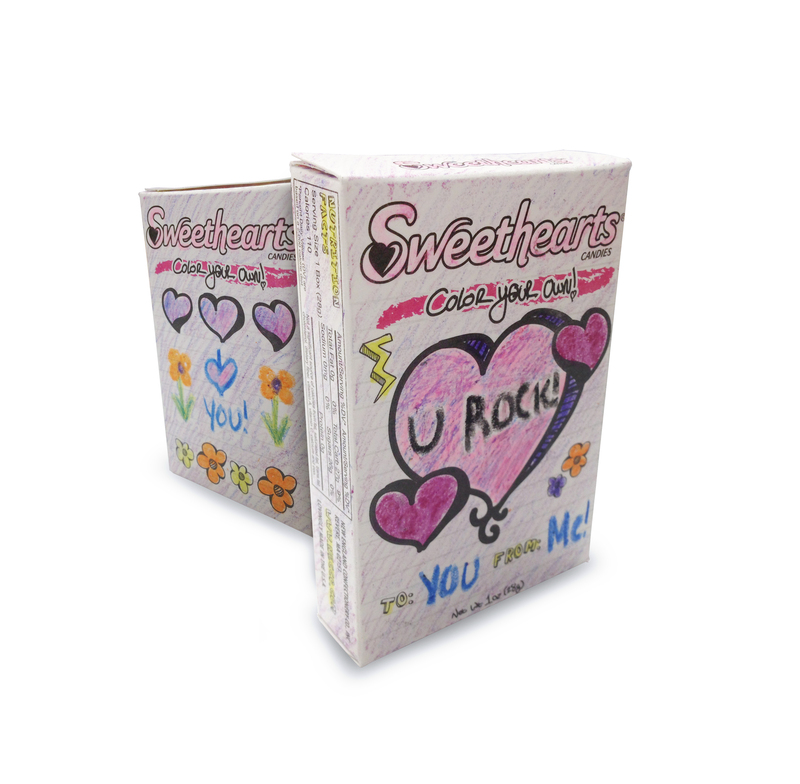 Send a Tweet to @Tweethearts that includes a love note that you would want printed on Sweethearts candy hearts for that special someone. You’ll receive a picture preview from @Tweethearts with what your #Tweetheart looks like. If it looks great, fill out your sweetheart’s name and shipping address, make a payment, and you’re done! Sit back and smile because you know that your gift was the sweetest surprise your loved one will get this Valentine’s Day season! Categories: Valentine's Day | Tags: Boston, candy, gifts, Hill Holliday, love, NECCO, new england confectionery company, presents, Sweethearts, sweetie, sweets, tweet, Tweetheart, Tweethearts, Twitter, Valentine, Valentine's Day | Permalink. Can you believe we’re already half way through January!? That means we have our eyes (and our sweet tooth) focused on one of our favorite days of the year: Valentine’s Day! It’s a special time of year when we are surrounded by sweet reminders of the love we have for one another. Kids especially love jumping in on the fun of both decorating and sharing sweet gifts with their friends and family. To celebrate Valentine’s Day, here’s a very quick and fun craft for you and your kids to have fun with in order to decorate your house for this wonderful loving season! Enjoy! Trace around the two circular objects on the heavy duty card stock, one circle inside the other, creating the wreath ring shape. Cut out the wreath. If your card stock is not sturdy, you can opt to trace a second wreath ring and glue the two together. 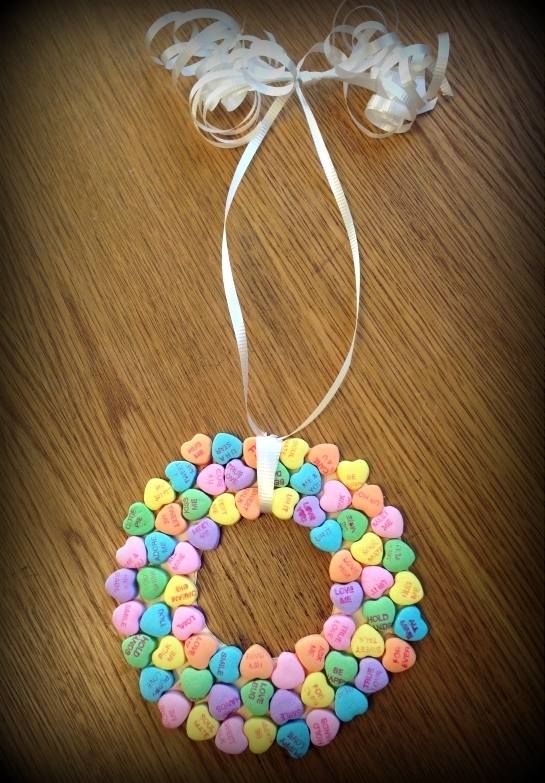 Line up the Sweethearts before you begin gluing them to ensure a more organized fit and distribution of colors. 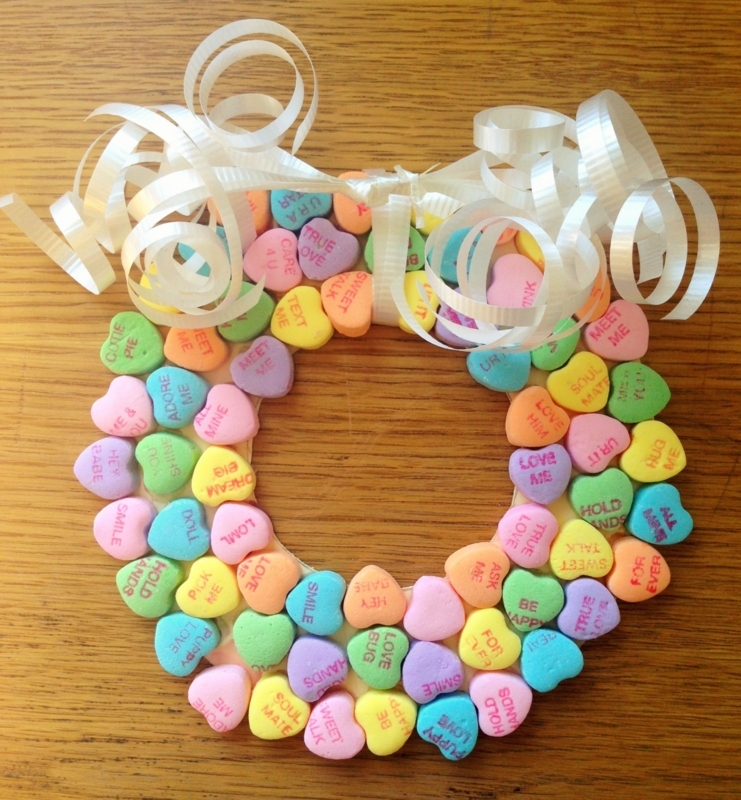 Using the squeeze white glue, glue the Sweethearts onto the wreath one by one. Press them firmly down onto the card stock and hold for several seconds to ensure they stick. Let dry completely or else the Sweethearts will either shift or begin to fall off when applying the ribbon. Categories: Crafts, Valentine's Day | Tags: arts and crafts, candy, Candy Hearts, conversation hearts, crafting, crafts, diy, hearts, holidays, kids, kids crafts, love, NECCO, new england confectionery company, sweetheart, Sweethearts, sweetie, Valentine, Valentine's Day, wreath | Permalink. Introducing: Color Your Own Sweethearts! Introducing new for Valentine’s Day this year: Color Your Own Sweethearts! This exciting new product will be sure to be a favorite treat for all Sweethearts lovers. They come in the original Sweethearts flavors of Lemon, Strawberry, Green Apple, Blue Raspberry, Grape, and Orange and are printed with the classic affectionate sayings you love so much! These Sweethearts have exciting boxes that feature adorable black and white designs, made for your little ones to color using their creative imagination! And what’s more exciting than just a fun activity and your favorite sweets? How about a contest!? Our youngest fans, ages 5-12, can submit a photo of their best coloring creation to our Color Your Own Sweethearts Coloring Contest for a chance to win some pretty sweet prizes!! 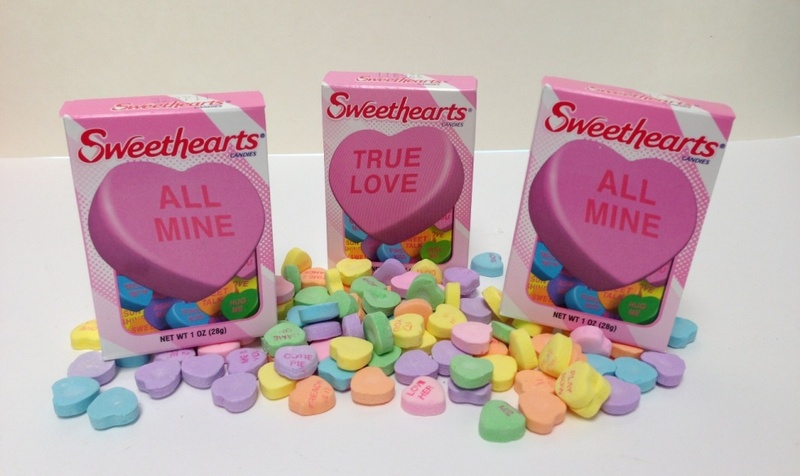 Grand Prize (One from each age group, 3 in total): ONE (1) $1,000 Savings Bond Certificate and the opportunity to have their own personal phrase appear on a Sweethearts candy for the 2015 Valentine’s Day Season! Runner Up Prize (One from each age group, 3 in total): a big NECCO goodie bag filled with yummy NECCO candies! Find the full Contest Rules on the Color Your Own Sweethearts Contest entry page here: http://necco.com/coloryourown.aspx! To find Color Your Own Sweethearts in store check your local Michaels, Old Navy, Walgreens, and Target as well as many other grocery stores and candy shops! Categories: Contests, Valentine's Day | Tags: art, arts and crafts, candy, Candy Hearts, Color Your Own, Color your Own Sweethearts, coloring, coloring contest, contest, conversation hearts, crafting, crayons, drawing, family, gifts, holidays, kids, kids contest, kids crafts, love, NECCO, new england confectionery company, Sweethearts, sweets, Valentine's Day, Valentine's Day Candy | Permalink. 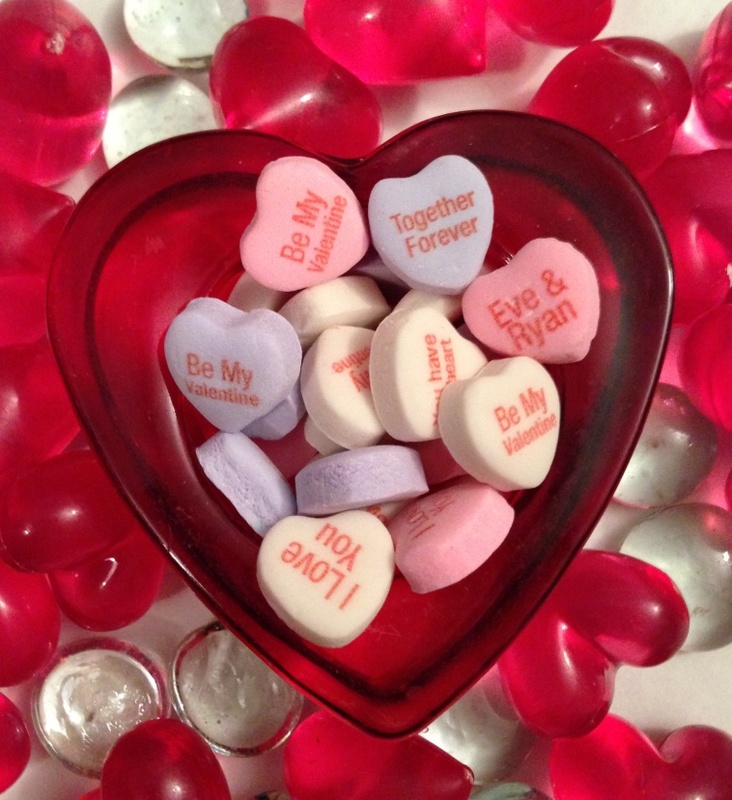 Personalize your Valentine’s Day with Custom Candy from MyNecco.com! Happy New Year everyone! We hope your holidays were filled with love, family, friends and many happy memories! With January comes one of our favorite times of year, Valentine’s Day! We just love to be a part of so many loving gifts and special celebrations with loved ones. 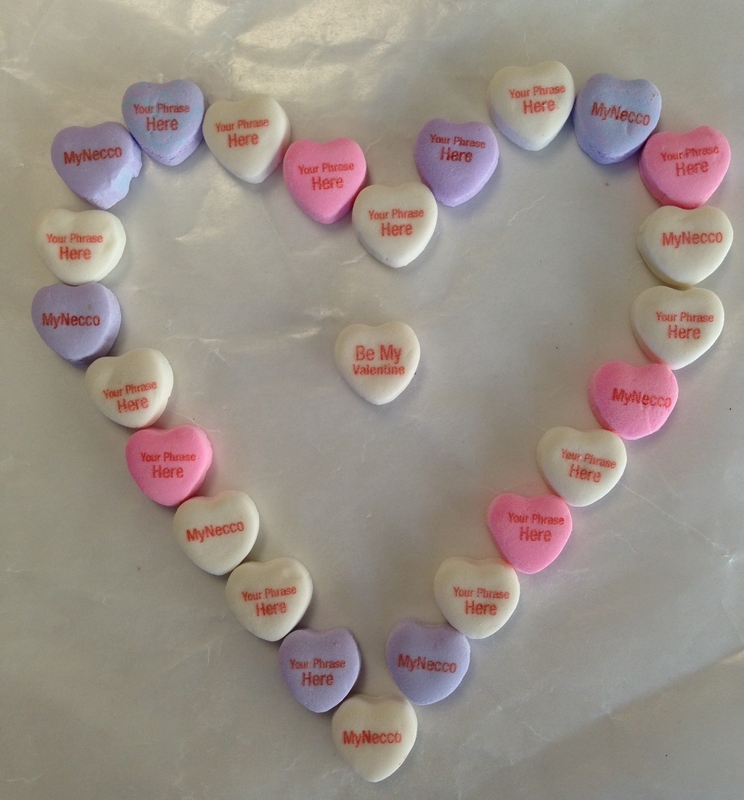 To help you commemorate such a loving and special season, we offer a custom candy service on our website MyNecco.com! What better way to surprise your Sweetie than with personalized Sweethearts this Valentine’s Day that include your own special sayings! 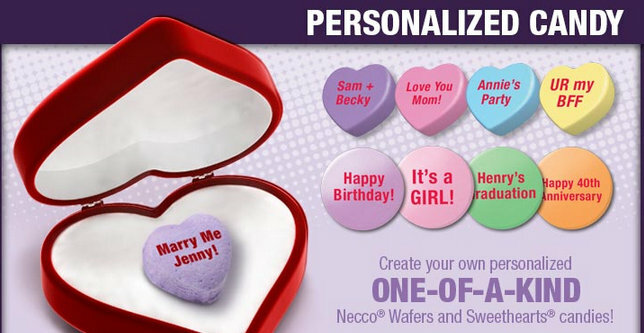 Log onto MyNecco.com and click on the personalized candy graphic. Select either Sweethearts or NECCO Wafers. Pick the three colors you would like to receive. Enter up to three phrases on your candy of choice. Select your quantity in either 1 or 5 pound increments and place your order! Imagine your own creative phrase, your Sweetie’s name, a special date, or other important personal message on a Sweetheart! It’ll be a touching gift that shows your special someone how important they are to you! Be sure to get your order in on time and get ready for an unforgettable Valentine’s Day with your sweetie! Categories: Valentine's Day | Tags: candy, custom candy, diy, DIY gifts, gifts, love, NECCO, necco wafers, new england confectionery company, personalized candy, Sweethearts, Tropical NECCO Wafers, Valentine, Valentine's Day | Permalink.